Arcelor Mittal is the world's biggest steel producer, it has an output of 100 million tonnes a year. That is 1,5 kg per person on earth per year. It makes 4 times as much steel as Nucor, the largest US producer. Steelmaking is a cyclical business, a number of profitable years can be followed by a string of losses. Currently Arcelor Mittal seems cheap, but we don't know how long this profitable cycle will last. SECTOR: [PASS] Arcelor Mittal MT is neither a technology nor financial Company, and therefore this methodology is applicable. SALES: [PASS] The investor must select companies of "adequate size". This includes companies with annual sales greater than €260 million. MT's sales of €69 000 million, based on 2017 sales, pass this test. CURRENT RATIO: [FAIL] The current ratio must be greater than or equal to 2. Companies that meet this criterion are typically financially secure and defensive. MT's current ratio $31 429m/$22 713m of 1.4 just fails the test. LONG-TERM DEBT IN RELATION TO NET CURRENT ASSETS: [FAIL] For industrial companies, long-term debt must not exceed net current assets (current assets minus current liabilities). Companies that do not meet this criterion lack the financial stability that this methodology likes to see. The long-term debt for MT is €16 000 million, while the net current assets are 8 700 million. MT fails this test. LONG-TERM EPS GROWTH: [FAIL] Companies must increase their EPS by at least 30% over a ten-year period and EPS must not have been negative for any year within the last 5 years. Companies with this type of growth tend to be financially secure and have proven themselves over time. MT's EPS have declined over the past 10 years, and it made a loss in 2012, 2013, 2014 and 2015. MT fails this test. Earnings Yield: [PASS]The Earnings/Price (inverse P/E) %, based on the lesser of the current Earnings Yield or the Yield using average earnings over the last 3 fiscal years, must be "acceptable", which this methodology states is greater than 6,5%. Stocks with higher earnings yields are more defensive by nature. MT's E/P of 18% (using the most recent earnings) and 12% using the average of 3 years passes this test. 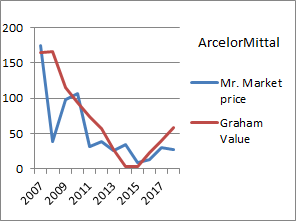 Conclusion: The stock is not expensive, but as long as there is overcapacity in steel production ArcelorMittal remains a bet, not a Graham Defensive Investment.